If you have Nick Jr you will probably have noticed that there are new Paw Patrol Mission PAW episodes each week (you can find out more here!). 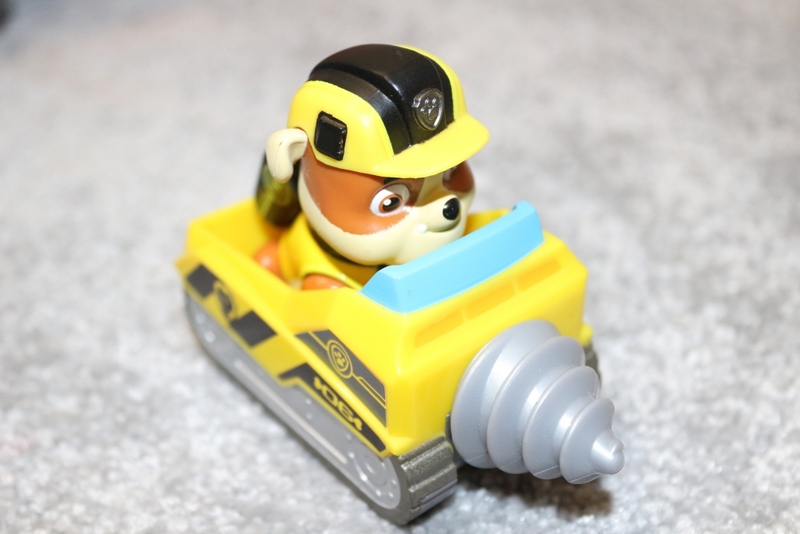 To accompany the new series, Spin Master have brought out a range of new preschool Paw Patrol Mission PAW toys. 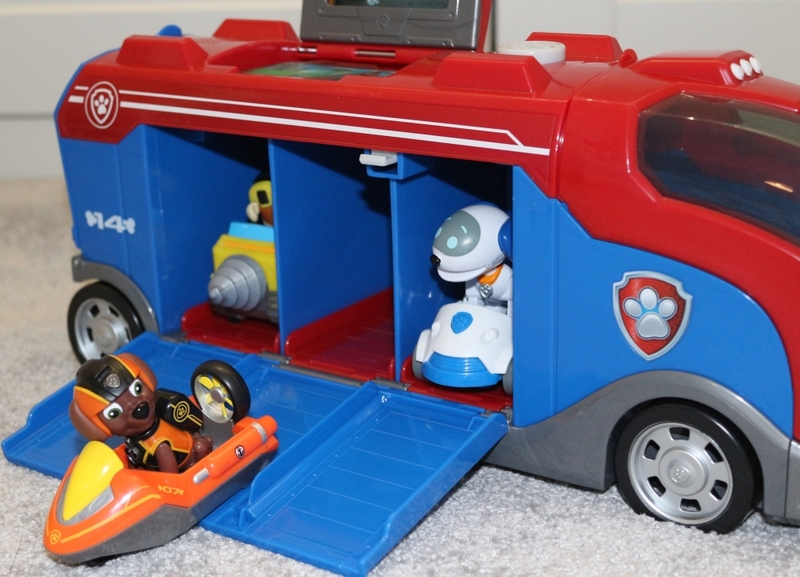 The PAW Patrol Mission PAW Mission Cruiser is one of the new range of Mission PAW toys for little Paw Patrol fans. 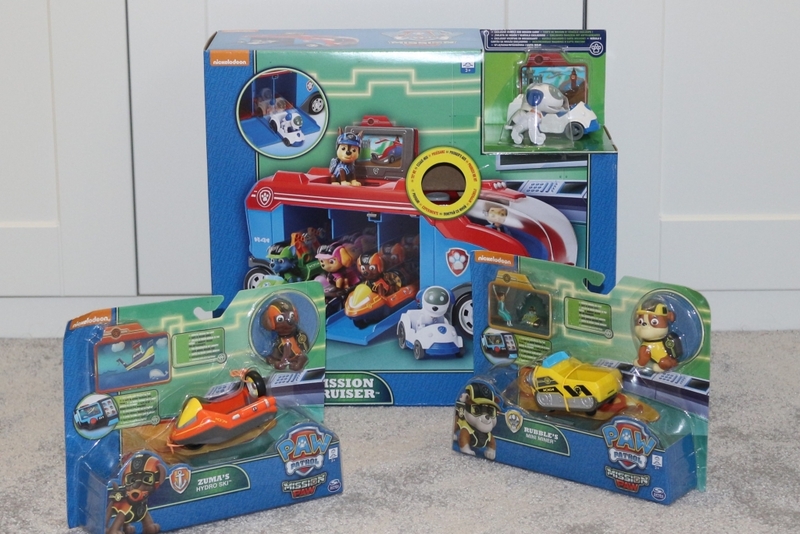 Being the small one’s VERY FAVOURITE TV show (and also enjoyed by the big one) we offered to review the PAW Patrol Mission PAW Mission Cruiser and Mini Vehicles from Spin Master. The Mission Cruiser, which has an RRP of £44.99 includes the Cruiser, Robo-Dog, Robo-Dog’s vehicle and one holographic Mission Card. Each Mini Vehicle has an RRP of £9.99. The Mission Cruiser is a sturdy plastic vehicle can be pushed along on its wheels. 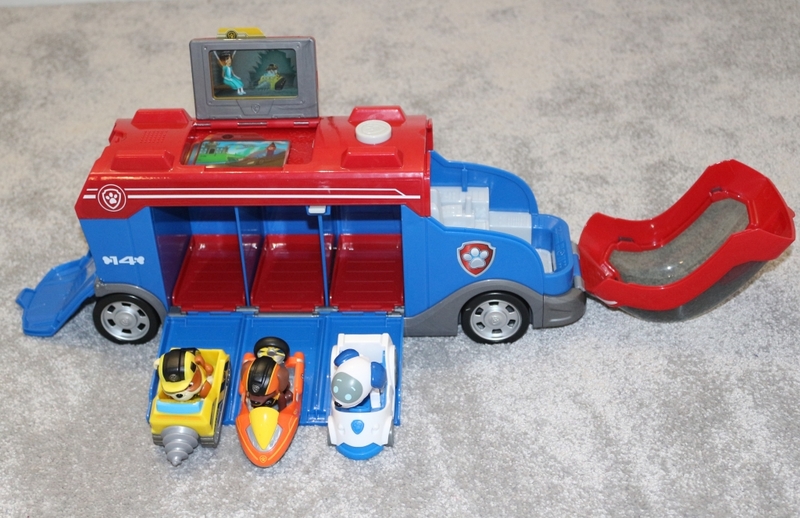 It opens in three ways; it has the front where there is space for Ryder and Robo-Dog to sit, the back in which you could keep a spare pup or Mission Cards, and the main vehicle body which you open by pressing the button on the top. This button pops up the Mission Card ‘screen’ into which you can place the little holographic cards, as well as releasing the side to reveal the cars inside. This is accompanied by Paw Patrol sounds (see the video to hear them!). 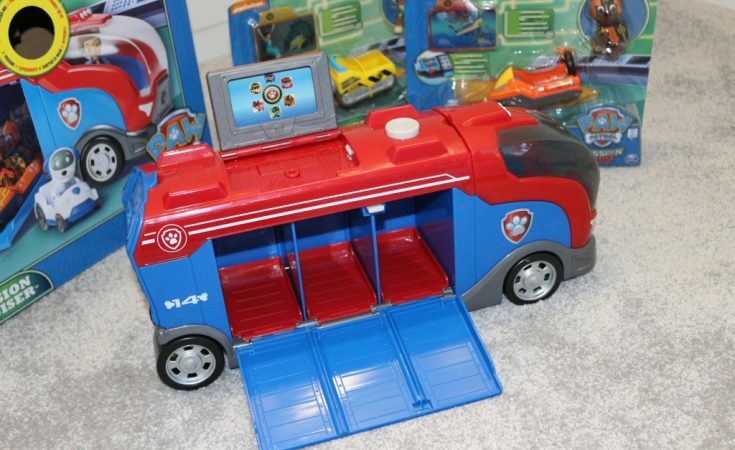 It does require LR44 batteries to activate the sounds, but comes with demo batteries inside it already. The cars can then be deployed by pushing the little red buttons on the back which tilt the pups, and off they zoom! 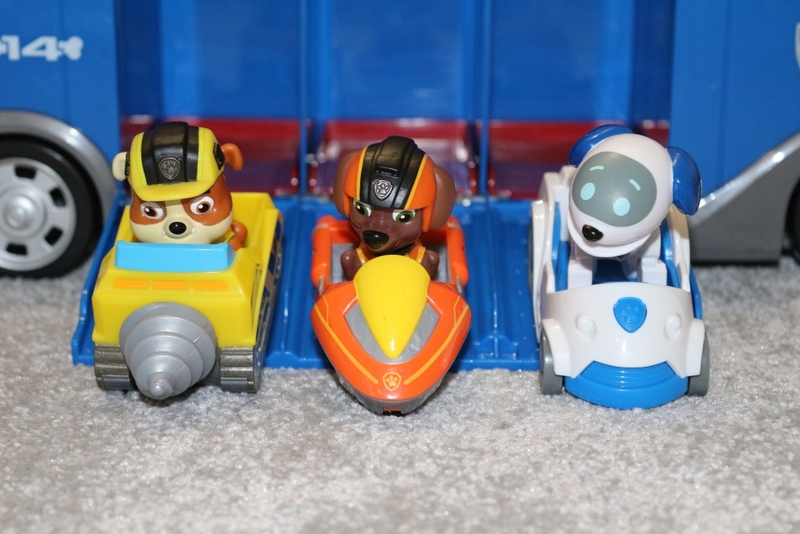 There are six mini vehicles to collect; Chase’s Three Wheeler, Skye’s Cycle, Marshall’s Rescue Rover, Rubble’s Mini Miner, Rocky’s Repair Kart and Zuma’s Hydro Ski. You can fit three in the Mission Cruiser at a time. 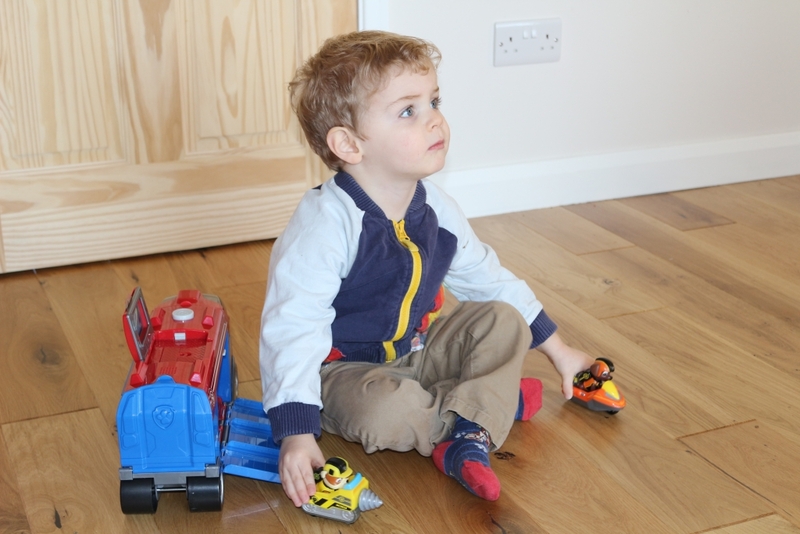 They have little wheels on the bottom and are best used on hard flooring. Each pack come with with one pup and one moving vehicle, as well as one Mission Card. You can twist their heads from side to side, and they slot into the vehicles with little holes on the bottom of their feet. These can be a little tricky to get in the right place, so you’ll probably have to do it for your child. The Mission Cards are compatible with the Mission Pup Pad which you can buy separately. I’m not sure how long they will last as they are made from thick cardboard, but the children will certainly enjoy using them to slot into the pop up screen to create ‘missions’. The Mission PAW toys are aimed at children aged 3 and over although my two year old loves the Mission Cruiser. As one of the world’s biggest Paw Patrol fans, he hasn’t really stopped pushing it around and making up little stories with the three characters that we have. Annoyingly maybe, I’m probably going to have to get him the rest of the team so that he can use his imagination acting out Paw Patrol adventures, although £9.99 is perhaps a little steep when there are six to collect so I’ll be looking out for a good deal. You can buy PAW Patrol Mission PAW toys from most good toy shops and from Amazon using the affiliate links below. These PAW Patrol Mission PAW toys were sent to us free of charge for the purposes of this review, but all opinions are mine. 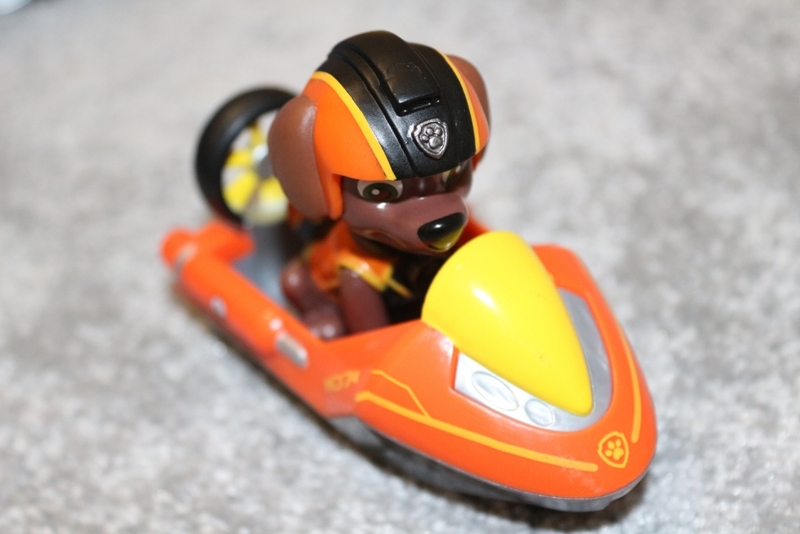 Do you enjoy PAWsome missions It’s pup pup and away with the new Paw Patrol Mission PAW Mission Cruiser and Mini Vehicles. Here is our review with video.